April 6, 2019, is not a day I’m going to forget any time soon. It was a day that reaffirmed my two professional loves, pedagogy and performance. Freelance musician/educator life is constantly in flux- long periods of moderate or low activity, short bursts of busy busy busy- and our states of mind can often match those highs and lows. February and March were relatively slow months for me, performance-wise, and as often happens when the balance between teaching and performing is so heavily weighted in the direction of teaching I was feeling distressed and burnt out. There were many things on the horizon, but there was also the slog to get there, through long days of lessons and rehearsals, and no small dose of a trauma anniversary relating to my time at the U. In a word, I was feeling stressed, crispy (that stage just on the edge of burnout), and worried. But I have faith in my abilities, my knowledge, and my experience, and I knew I had to power through, so I got to work. And having goals? That means everything. A huge component of my pedagogy is helping people find Flow- find that place where distractions and worries slip away, and they work in the moment toward musical communication. It’s an inherently healthy state for our minds to be in. In a focus-challenged society, Flow States help us balance anxiety, depression, and stage fright; they help us do something for the sake of itself and gain reward from the result. I’d been losing track of my own Flow lately. Too much time trying to manage a social media presence for both my personal and professional life here, a healthy dose of staring out the window willing the flowers to come up there. So back to those goals. Number 1: Present my pedagogy in an hour-long clinic at Twin Cities Trombone Day. Be convincing, be engaging, let the science prove itself. Sitting down to refresh myself on the source material took away almost all my worries. Being honest with a few folks about the struggle I was having to create an introduction to the clinic led me to some awesome suggestions that ultimately let the whole talk tumble forth fully formed. And walking around all week reciting, “You are an expert, you are the boss” certainly helped. Guess what? That presentation rocked. The audience, a mixed crowd of professional, student, and amateur trombone players, was so open-minded and supportive, asking good questions and giving great feedback to the young folks who came up to help me demonstrate. Afterward I talked with so many people whose eyes were opened to a new way of thinking, and took a few cards to follow up on taking the clinic on the road. Goal Number 1 had a bonus effect on Goal Number 2: Rock the bass trombone parts on the AMO charts. Bass trombone, and in particular my 1970s Holton 180 BEAST of a bass trombone, sometimes feels like driving a U-Haul through the Rocky Mountains with one arm tied. It’s hard. I’ve been working for a year on improving my air efficiency, my intonation, and my control over the lower register. In getting back into the research, the thinking behind my natural learning-based pedagogy, it reminded me that I have been overthinking the hell out of approaching the bass trombone. I was letting all the little things I didn’t hear myself doing well ramp up my anxiety, and man, the self-talk was DIRE. But coming out of a funk, remembering why I do what I do, and getting back into Flow made all the difference. There have been numerous times in my life that have been tremendously musically rewarding. Almost nothing can compare to the act of finally putting something out into the world that people can hold in their hands, an album, and celebrating the artistic labor of love that went into every second. I’m just a tiny part of the AMO, but when it all came together, it felt like no moving piece was too small. We were all working together to put Adam’s incredible music out into the world, and enjoying the collaboration. And to have an appreciative audience. What a joy. The act of sharing art, and feeling the reciprocation back. Music requires an audience, and communication goes both ways. We give what we have, the audience tells us how that makes them feel, we give more, etc…the loop feeds itself and everyone is better for it. So how am I feeling this week? Incredibly, incredibly lucky, but also satisfied. I’ve done the work, I’ve sought the knowledge, I’ve walked the walk. Owning one’s strength is not egotistical, even if it can sometimes feel that way. I’m learning to overcome that learned impulse and walk into every room with confidence that I belong there- because I do. Stay tuned for more photos & videos from the AMO CD Release show. Meantime you can order the album here. 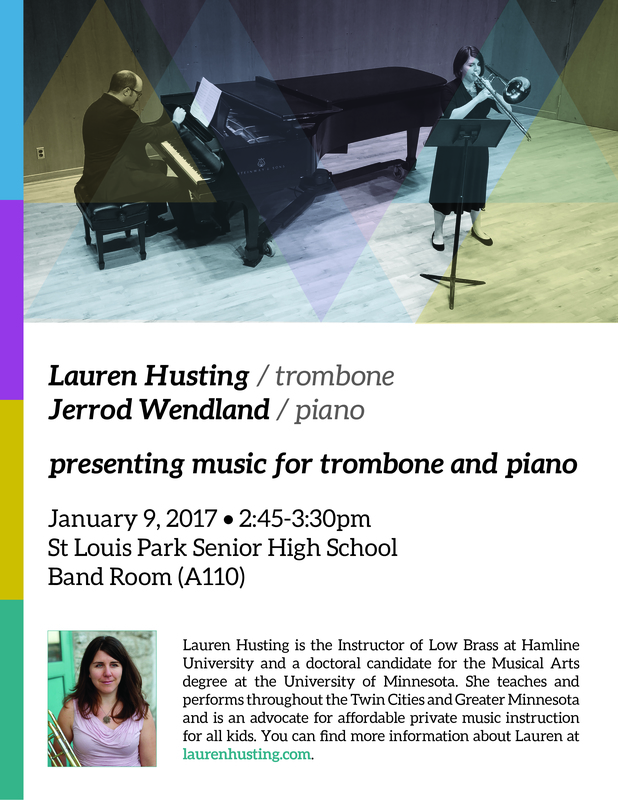 My performance at St Louis Park Senior HS, featuring selections from my December 2016 doctoral recital, is presented in part by the generous contributors to my Studio Scholarship Campaign. As you recall, the fund exceeded its goal and I allocated $300 to presenting clinics and performances in local schools. This is the first opportunity I’ve had to use this money, and if you’d like a performance at your school, please reach out to me! At the end of January, BrassChix soars again! This is my 4th (or 5th?) year presenting for BC and I’m so excited for this year’s theme: How LOW Can You Go? We’ll be focusing on our sisters of low brass and the lowest notes from every horn. This summer I am excited to be offering two different clinics for brass players through West Bank School of Music. Find a full list of classes and information on registration at this link. 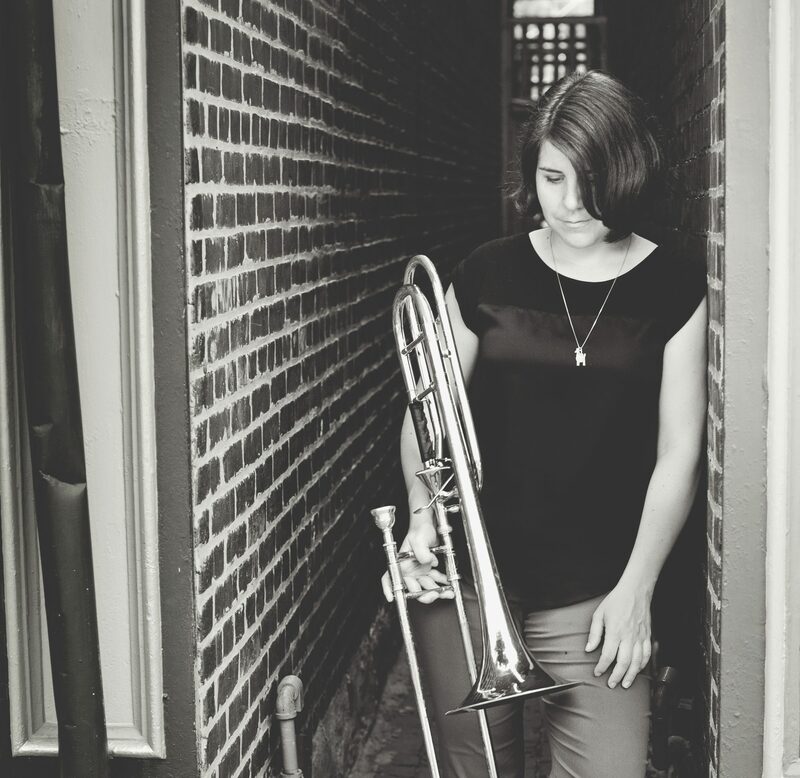 Learn a natural approach to playing a brass instrument through healthy, holistic methods. Session 1 – “Sound”: How air makes all the difference. Session 2 – “Music”: Brass playing is as easy as singing. Session 3 – “Focus”: Practice techniques that create solid foundations for learning. Is your child starting a brass instrument at school in the fall and want a head start? Get them ready for fall band through sessions that will introduce them to their instruments, show them how to make a good sound and read music, foster proper technique, and get them going with playing songs!